Frustrated Gerard Lyttle insists the time for excuses is over from Cliftonville. The Reds have laboured to just one win from their first four games in the Danske Bank Premiership this season. 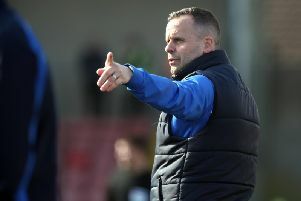 An opening day draw against newly-promoted Ards was followed by a spirited win against Glentoran. It was a brief respite, however, with defeats against Glenavon and Dungannon Swifts giving Lyttle an early-season headache. “It has been very frustrating,” he said. “The draw against Ards was disappointing but I got a response against Glentoran. “I think we were unlucky against Glenavon, and some big decisions went against us. “The Dungannon performance was flat and too many players just didn’t turn up. “We can’t have that in games. Teams raise their game against us and we have to fight tooth and nail if we want to get points on the board. “We have a lot of quality, but you have to earn the right to showcase that quality in games, and we haven’t done that. Lyttle will have new signing Ruairi Harkin available for Saturday’s trip to Ferney Park. Harkin – a summer arrival from Coleraine – has been recovering from a knee strain. “That is a big boost for us,” Lyttle added.